Of course, there was a time when belfries simply refused to stay in one place. I assume they were on wheels, because these tall structures began their lives as siege engines. They would be hammered together by some army or other at the site of a siege, to scale an unscalable wall on a great fortress. Inside, if they were really accomplished belfries, there might be bowmen; or, a slightly more bizarre option, men with long pikes. Tall towers on wheels and pointed sticks: the stuff of war all over the world. A belfry was named , not after the bells it has housed for centuries, but rather comes from an old French word, berfrei. That in its turn is a mix of two Germanic words: *bergan “to protect”, and *frithuz “peace”. When you’re taller than everyone else, even if it’s only standing on a structure your mates hammered together five minutes earlier, it is a distinct advantage. At some point, they stopped throwing them together and putting wheels on, and began to build them in the centre of settlements as a vantage point, a land-lubbing crow’s nest. 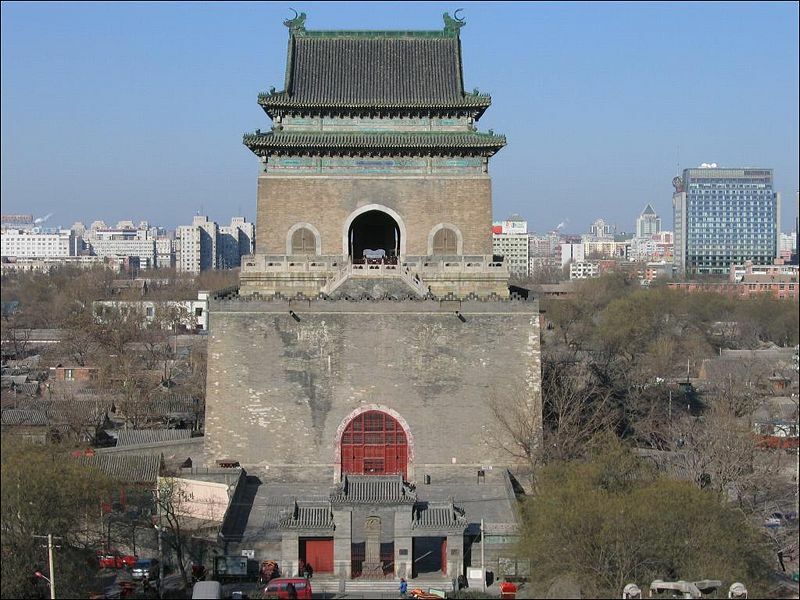 We have to be broad-brush about dates and purposes here: Beijing’s bell tower was built in 1272, under Kubla Khan, as The Tower of Orderly Administration, a time-keeper for the cities masses. Ghent’s was begun in 1313, served time both as a fortified watch tower and treasury. Valencia’s stunning Micalet was built not by the church but by the local gentry, who were in a hurry to show might in the face of the Moors in 1350. When one sees something one does not like, one must sound an alarm. And so it became customary to have a bell up there with you when you were watching for mishaps. I have heard that they didn’t use them much because flags were far better for communicating over distance: but this may be pure speculation. They liked the bell, and the bell stayed. Over time, man has come to the conclusion that a defensive tower, once it has shed its wheels, should be an object of posturing splendour to all who behold it. Belfries are everywhere: UNESCO’s World Heritage sites list 33 of special interest in Belgium alone, and 23 in France. The leaning tower of Pisa is a member of this gentleman’s club. And women may say size is immaterial, but even they must acknowledge that some of the Italian belfries are handsome to the point of seduction. Take Venice, for example. A stiff Victorian travel guide of the type so popular at the time cites the belfry- or more musically, campanile – of St Marks. It is reached by a narrow staircase, it seems, according to a Handbook For Travellers in Northern Italy, published in 1866. I can almost see the angel’s view of the roofs and gleaming waters of the Doge’s city. You can judge a city by the size of its belfry, those old wives tales say. It is not long since a belfry bludgeoned its way into the front of our consciousness. Because what man has put up, nature can vanquish in a few short seconds. The town of Lorca, in the Mercia region of Spain, has an ancient history. Remains have been found from as far back as the Bronze age. The Romans tramped the town and Visigoths made it theirs. It became a perilous border city when Castile squared up to Moorish Granada, and belfries became imperatives. Our subject has been cited as mediaeval. I have been poring at footage of that day in May 2011 to fathom which church it belongs to and so far, I have drawn a blank. But I know the appearance of the church very well by now. It could withstand centuries of humanity, but it could no more resist 5.2 on the Richter scale, just six miles underground, than a feather could withstand a boulder. It owes its moments of world-wide fame to a news crew standing nearby, who happened to capture its headlong descent, and who almost became victims themselves. On a scale of national disasters it was not of epic proportions: but those seismic waves, who can be blamed on no-one, rent apart many lives, and the history of centuries. But we will mourn that belfry, just the same. A repost. Did you guess? Posted in In the newsBookmark the permalink. A moveable bats’ home of noble and daunting proportion. Poor old bats, eh, Roger? Dear Kate, once again–learning from your post. I always thought the towers used against a fortress were called “siege machines.” Now I learn they were belfries. And I didn’t know about the fall of the Spanish belfry, With great frequency the US media misses what’s happening anywhere but here. I so like the first comment from “Food, Photography & France,” because the truth is that the word “belfry” doesn’t come to my mind without its accompanying “bats.” Peace. The displaced bats from Lorca probably went on to inspire a few more bloggers by providing them with the necessary prerequisite. Do you know, I wrote this so long ago, Col, I cannot recall 😀 Off to sort it out! I saw the photo first. Thought, “Looks … Chinese. What’s it doing in London?” In any case, fascinating story. Wow, it turns out that I knew nothing about belfries! Thanks for re-posting this well-written piece of yours, Kate! Hi Courtenay, hope life is treating you well 🙂 Thanks for reading. who would have thought that the word Belfry had nothing to do with bells! And let us not forget Quasimodo and his role in Notre Dam Cathedral’s bell tower. Thanks, Kate, for another fascinating yarn. Sorry, should be … Notre Dame Cathedral. As always, thanks for the history lesson. Easter blessings. So interesting, Kate. I can relate all too well to the seismic activity. My beloved San Gabriel Mission lost its bells (from the belfry) in a large earthquake in the 80’s. The poor old missions have had lots of damage through the years because of our terrifyingly shaky ground. And to be honest, I assumed the word “belfry” was somehow connected to the word “bell.” Interesting!